Saturday, June 24th, 2017, outside the State Library of Victoria. It was good to be back with my friends from the Al Quds association of Melbourne, and it was a privilege to be invited to address the gathering. Sisters and brothers, we stand here today at a significant point in the history of our planet and in the history of the Palestinian people in particular. 2017 marks one hundred years since the Balfour Declaration – that document that set the world on a trajectory towards the establishment of the State of Israel in Palestine, and so initiated the most defining human struggle of our generation. 2017 further marks the 50th anniversary of the six-day war of 1967 – an event that took the dispossession of the Palestinian people, experienced in an Nakba in 1948, on to a whole new level. As a result of that short war, the State of Israel took control of the Gaza Strip, the West Bank, East Jerusalem, and the Golan Heights, and life has never been the same in any of those places since! We are probably aware that the people of Gaza are currently under threat of having all their electricity cut off! That is true, but we are talking about a city that already only gets electricity for about four hours per day! More than that, half the population of Gaza is currently food-insecure, the unemployment rate is one of the highest in the world, and, according to UN estimates, if nothing changes, Gaza could be completely uninhabitable by 2020! These figures give us just a small taste of what life is like for the millions who live under Israeli rule as second-class citizens due to their ethnicity. The depth of the humiliation and deprivation is without modern parallel, and the longevity of this occupation is mind-blowing! I cannot imagine that when Ayatollah Khamenei inaugurated Al Quds Day in 1979 that he thought for a moment that the Palestinian question would still remain unresolved some thirty-eight years later! It shames the whole of humanity that this injustice has been allowed to continue for so long, and we may be tempted to despair, until we see the flip-side of this tragedy. For the flip site to this 100 years of imperial dominance and fifty years of military occupation is 50 years of active resistance, and 100 years of refusing to bow to the dictates of power! The endurance of the Palestinian people is simply amazing when you think about it. The great Israeli activist, Uri Avnery, said that the Zionist plan to uproot the Palestinian people and claim the land for a single race is based on a lie – a lie that considers Palestinian people to be less than human, such that if you kick them enough they will (like dogs) simply limp away with their tails between their legs! Fifty years of military occupation has shown this to be a lie! Fifty years of violence, discrimination, deprivations, housing demolitions, targeted assassinations, and endless checkpoints and harassment have shown that the strength and resilience of the Palestinian people cannot be underestimated. After fifty years of violence, the Palestinian people continue to stand tall, continue to maintain their dignity and continuing to resist – the recent hunger-strike, led by Marwan BarghoutiMarwan Barghouti, being the latest great act of non-violent defiance! The resilience of the Palestinian people in the face of oppression is indeed a source of inspiration, and I believe that the rest of the world is finally starting to wake up. There was a time when, to many in this country at least, Palestine was thought of as just another Middle-Eastern issue – certainly only as an Arab issue, and truly only as an issue for Muslim people. That time has passed. I was greatly encouraged to read this week a coalition of Palestinian Christian organisations reaching out to their sisters and brothers around the world through a letter to the World Council of Churches – an organisation that includes 348 member churches from more than 110 countries, representing over 500 million Christians. The letter expresses the urgent need for Christians everywhere to stand in solidarity with the Palestinian people – “We are on the verge of a catastrophic collapse. The current status-quo is unsustainable. This could be our last chance to achieve a just peace”. The appeal has not fallen on deaf ears, and so it seems that the World Council of Churches may indeed now follow the lead taken by a number of church bodies in the United States and adopt the Boycott, Divestment and Sanctions (BDS) program – that great non-violent Palestinian initiative that hits the machinery of Occupation where it hurts – in the hip-pocket. There is much to grieve in the last fifty years of Occupation, but the resilience of the Palestinian people is, I believe, finally leading to a universal awakening. People around the world are waking up to the lies that they are being fed by their governments and by the ever-compliant mainline media. The recent election result in Britain, the Brexit vote, and even the result of the last election in the USA are all clear indicators that people are fed up with the lies, even if they aren’t quite sure at this stage what to do about them yet! People everywhere are recognising though that the emperor has no clothes and that the imperial narrative that generates endless cycles of war around our planet is without foundation. At the heart of that narrative is the web of lies that maintains the Palestinian Occupation – claiming eternal victimhood for the State of Israel, and depicting the Palestinian people as sub-human, angry militants. All this is starting to unravel, and we stand here today as a testimony to that unravelling. We come together today as a mixed multitude, representing various different ethnic groups, language groups, and countries of origin. We come together as a mixture of Muslims and Christians and, I suspect, any number of other faith traditions. In our diversity we represent peoples across the world, and yet we are unified in our love for God, our passion for justice, and hence in our solidarity with the Palestinian people. We do not accept the lies. We will not accept the endless humiliation and subjugation of the Palestinian people. At this crucial point in human history we take our stand in solidarity with the oppressed in Palestine and around the world. Not long now, sisters and brothers! Liberation is coming! God has heard the cries of the oppressed. A new day will dawn and justice will come – enshallah, very soon. Tags: al quds, Al Quds Day, father dave, israel and palestine. Filed under israel and palestine articles by Father Dave on Jul 4th, 2017. Comment. Saturday, July 2nd, 2016: It was again my privilege to be invited to speak at an Al Quds Day event, this time in the grounds of the Kingsgrove Mosque. I was surprised to receive applause about half-way through my brief address and I wasn’t sure at first what prompted it. It was afterwards that a Palestinian man came up to me and said “you said what we needed to hear. You told us not to forget Palestine. We are afraid that the world is forgetting us”. Indeed the man’s plea makes sense. When there is so much trouble at home and abroad to absorb our energies, it is easy to forget the ongoing trauma of the Palestinian Occupation. The longer it goes on the more we are tempted to normalise it! In truth, we must never forget Palestine! The video below covers the first half of my address. Please see the transcript below for the complete version. As most of you would know, I returned not long ago from Syria – my fifth visit there in the last four years. One of the great tragedies of Syria (and there are many tragedies associated with that great land at the moment) is that the violence and injustice being visited upon the Syrian people is so extreme that it can easily absorb all of our time and emotional energy and so distract us from other tragedies in our world that also deserve our prayers and our attention. It’s not only Syria, of course. When we think of the suffering of the people of Yemen, and also of Iraq and Libya and the suffering of so many of our sisters and brothers around the world, it’s easy to feel overwhelmed and have no space in our hearts left for the people of Palestine. After all, there’s only so many people you can pray for at any one time! I recognise in myself that I have fallen victim to this. 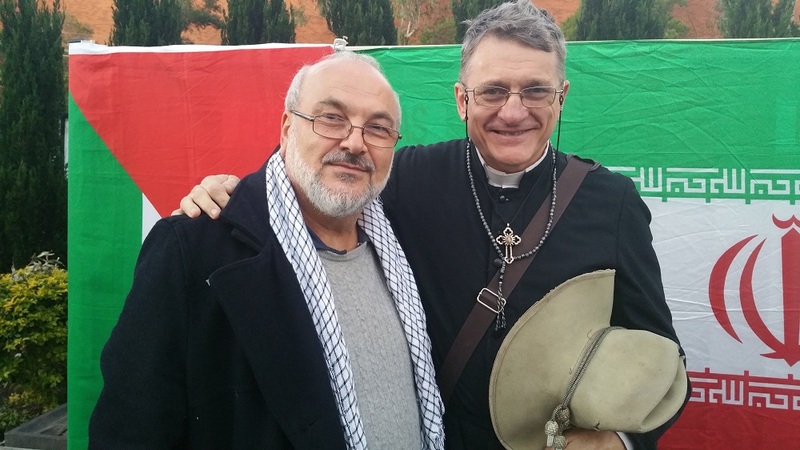 I’m almost embarrassed to admit that I am president of Friends of Sabeel, Australia – the Australian church’s attempt at Palestinian Liberation Theology. I am supposed to be a recognisable face in the Palestinian struggle for justice and freedom, and yet I find the concerns of the Palestinian people have taken a back seat for me as my energies have been absorbed by other concerns that seem even more pressing! The truth is that there is no more pressing need in our world than that of justice for the Palestinian people, for in truth, all these global tragedies we grieve are connected. As my friend, Bishop Riah Abu El-Assal (former Bishop of Jerusalem, himself a Palestinian) said “the road to world peace goes through Jerusalem”. I believe this is true. I don’t mean that if we solve the Palestinian issue that all the other pieces of the puzzle will suddenly, magically fall into place, but I do believe that unless we put an end to the abuse and discrimination and disenfranchisement experienced by the Palestinian people, these other issues we struggle with will never be solved! This year has been another hard year for the Palestinian people and, as I say, it has been a difficult year for all of us whose hearts yearn for Palestine. The problem has been further exacerbated too lately by initiatives taken within the Islamic world to divide the ummah over their attitude to Israel. The Saudis have made a number of statements in recent months that seem to endorse the Israeli government and would thus encourage Muslims everywhere to accept the Palestinian Occupation as normal! I don’t know whether the long term effect of this will be more love for the Israeli government or more hatred for the house of Saud. I suspect the latter. Either way though, I am tempted to say “welcome to the club”. The Christian community has been similarly afflicted for many years by prominent voices urging the faithful around the world to turn a blind eye to the abuse of the Palestinian people! The other things I say is “thank God or Al Quds Day!”, and I mean that. In spite of the clamour of voices urging us to forget Palestine – voices coming through the media, through our political leaders, and (as I say) even from within the ranks of the faithful, on Al Quds Day we cannot forget Palestine! The suffering of the Palestinian people is real and it is ongoing, and it cries out to Heaven for redress! God knows that the barriers to justice and freedom seem as intractable now as they ever have been, if not more intractable! Even so, we must do what we can and we must not give up! We must pray, and we must speak out, and we must take action wherever we can to uphold the dignity and humanity of the Palestinian people. We may fear that our efforts will never amount to much. Even so, I am always encouraged in this regard by the comparison Jesus made between the Kingdom of Heaven and the yeast that’s sprinkled into dough to make bread. The yeast seems insignificant when mixed in with the dough, and it is virtually indistinguishable from the rest of the lump. Even so, we know full well that when the time comes, these small flakes of yeast become the agents of extraordinary transformation! This is our hope too – that even though our collective effort seems small, that God will work through us and through all who remember Palestine today to bring about extraordinary and genuine transformation. Thank God for Al Quds Day. Thank God for the ongoing strength and resilience of the people of Palestine. Thank God for the privilege of being able to participate in the process of transformation towards justice and peace. Tags: al quds, Al Quds Day, father dave, israel and palestine, israel and palestine conflict, justice and peace, palestine, syria, Thank God, time. Filed under Israel and Palestine, israel and palestine conflict by Father Dave on Jul 6th, 2016. Comment. The latest round of violence in Israel/Palestine is sickening. The Australian media coverage of that violence is also sickening. The news reader reports “seven Israeli’s have now been stabbed by Palestinians”! She then adds (almost as a parenthesis) that “forty Palestinians have also been killed, including several of the attackers”. Why are the facts always presented this way, as if Israeli lives matter more than Palestinian lives? Given that there were more than five times as many Palestinians than Israelis killed, why aren’t we told first that 40 Palestinians have been killed – the vast majority of whom were apparently not involved in attacking anyone when they were killed. I appreciate that this is a very small point made with reference to a very small news segment, and yet this was the ABC – Australia’s government-owned national broadcaster! I have a friend who works for the same broadcaster and she told me last year that ABC presenters were no longer allowed to use the word “Occupied Territories” when referring to the Palestinian West Bank. They now have to say “disputed territories”. This may again seem like a very small point, and yet this is our government trying to control what we say in order to control what we think, and we simply should not have to tolerate this form of politically-inspired thought control! For me nothing sums up the current spate of violence more succinctly than this leaked video of the death of Israa Abed. Be warned that even though you don’t see any of the gory details of her death it is nonetheless gut-wrenchingly difficult to watch. According to the Times of Israel, Israa Abed was a would-be assassin. According to the Jerusalem Post, she was a ‘female terrorist’. 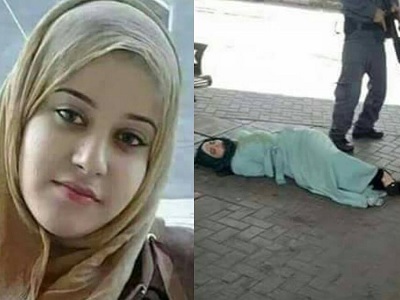 According to both reports she was brandishing a knife and told to put it on the ground before being shot by IDF soldiers. No knife can be seen in this video. What we see is a girl with her hands in the air. Certainly, even if she’d been carrying a large machete, she would have posed no threat at all to the ten heavily armed soldiers who surrounded her. Other reports say she was refusing to take off her hijab when she was shot. Her father and her brother (both of whom were arrested after the shooting of Israa) said that she suffered from mental illness. Perhaps that explains why she didn’t remove her clothing when ordered to do so, or perhaps she was just scared? Israa was 28 and the mother of two children. I’m guessing that she was one of the ‘several attackers’ mentioned in the news report who were amongst the 40 killed. I wonder what the others did that warranted their execution. Tags: ABC, father dave, Israa Abed, israel palestine, occupied territories, Palestinian West Bank, round. Filed under israel and palestine articles, israel and palestine conflict by Father Dave on Oct 20th, 2015. Comment. 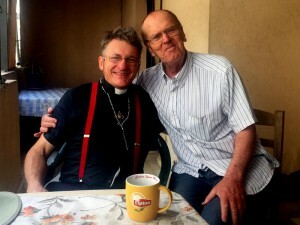 There have been some very encouraging signs in the church of late regarding the Palestinian search for justice. If we can put to one side the epic failure of the US Episcopal church to get behind the Boycott, Divestment and Sanctions campaign (BDS), it seems that there is nonetheless a shift worldwide in Christian consciousness towards Israel and Palestine! For one thing, the United Church of Christ displayed great moral courage at the very point where the Episcopalians failed. They voted to get behind the BDS! Even more encouraging is the initiative being taken by the Pope, taking the lead for millions of Catholics around the world in recognising the state of Palestine and insisting that no one race or religion has exclusive rights to the Holy Land. Evidently this stance has come at no small cost. Apparently the Sanhedrin is going to put him on trial unless he renounces his apostasy! Yes, you heard right – the Sanhedrin (or at least some self-appointed group calling themselves the Sanhedrin). Surely it would only be self-defeating for any such body to try to do to such a church leader what was done to her founder! Regardless of what happens to Pope Francis, this new shift of Christian consciousness is greater even than he, and perhaps the most encouraging signs are those coming from within the Holy Land itself! 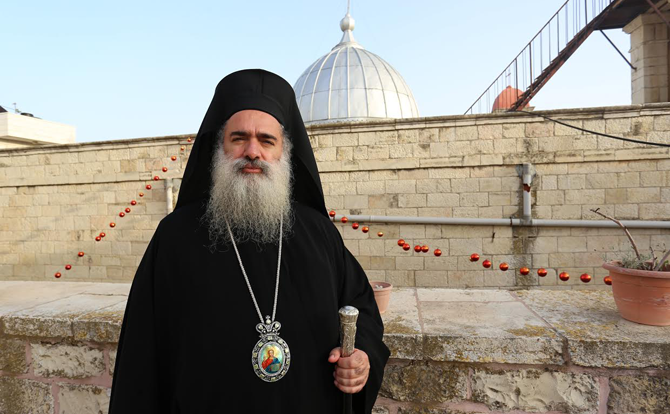 Archbishop Attallah Hanna is Archbishop of the Greek Orthodox Church in Israel/Palestine. As a Palestinian he has had to endure the Israeli Occupation for all his adult life, but now he has to face an additional new threat – that of ISIS, who are threatening all kinds of violence towards Christians as a part of their promised ‘liberation’ of Palestine. The Archbishop’s response is a courageous one. He refuses to abandon either the land or the Palestinian cause, and he refuses to distance the Christian community from their Muslim sisters and brothers with whom they share their land. Moreover, he refuses to give in to hate, saying “our Christian dictionary does not include the language of vengeance, hatred and rancor”. Tags: Archbishop Attallah Hanna, Beit Hanina, church, father dave, holy land, ISIS, israel, palestine, palestine liberation organization, Palestinian National Authority, Pope Francis. Filed under Israel and Palestine, israel and palestine articles by Father Dave on Aug 11th, 2015. Comment. What follows is another excellent essay from my friend Franklin Lamb, detailing why ISIS is proving so seductive for Palestinians. Fundamentally, it seems to be the only show in town! The allure of ISIS is the flip-side of the failure of the current Palestinian leadership to deliver. Both Fatah and Hamas seem to be equally riddled with corruption and compromise. To whom else are the Palestinians to turn? Of course ISIS don’t really give a damn about the Palestinians. That was amply illustrated by their response to Israel’s last brutal assault on Gaza. What did ISIS do in response? Nothing! They didn’t even offer a word of criticism! Why? Because they hate the Muslim Brotherhood (ie. Hamas) more than they care about the Palestinian people. It is equally well-illustrated by ISIS more recent butchering of the Palestinians of Yarmouk in Syria. I don’t expect to see ISIS boots on the ground in Palestine any time soon. Their goal is purely to win the PR campaign over their competitors, which only serves to highlight the need for a credible alternative – one that is genuinely committed to the needs of the Palestinian people. With its resilience, on-the-ground “achievements”, adaptability, global franchising, copy-cat knock-offs, chameleon-like adaptations, combinations and permutations, and slick honing of medium and message, ISIS is offering oppressed and desperate populations in this region both hope and fantasy for escaping their deepening misery The dream is to escape abject poverty and indignity by any means necessary, and joining ISIS or other like-minded cash-flush groups, which seem to appear out of thin air these days, is the most promising way to do it. One of the most urgent crises in Lebanon’s camps is the fact that the few remaining Palestinian hospitals are also nearing collapse, particularly Haifa Hospital in South Beirut’s Burj al Barajneh camp.. The two main Palestine Red Crescent Hospitals, Gaza and Akka, closed decades ago. These problems are just a sampling of what life has become for Palestinians currently living in Lebanon, and for almost 50,000 more that have come from Syria and are still stuck here. First and foremost, Da’ish pledges Full Return for the nearly 12 million Palestinian refugees scattered around the world. Approximately 6.4 million Palestinians had their homes and lands occupied in 1948 (55% of the total population), 4.5 million now live outside historic Palestine, and some 18 million live in the West Bank and Gaza Strip. Da’ish is also offering an alternative to the half-century of fake “peace processes” and an alternative what increasing numbers of refugees claim is the quisling position of the current PLO leadership. Tags: Gaza Strip, ISIS, Lebanon, life, West Bank, Zionist. Filed under israel and palestine articles, israel and palestine conflict by Father Dave on Aug 8th, 2015. Comment.